Bottle 50cl, a clear yellow beer with medium head. Nose is on barley sugar and grassy hops. Aroma is very near the usual licorne, bit more hops bit more toasted, but still boring and low tasty. Bottled in a perfect personal 50cl bottle with a full colour burned print. 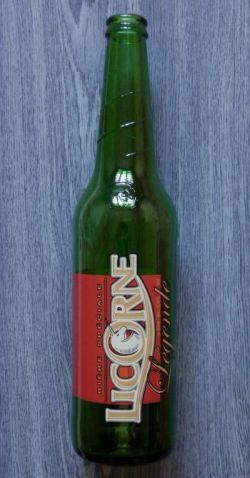 Bought 20 bottles of this just to show that french people can brew lager typed beers. Nice gold colour with a small foam head. Good lagerbeer with a nice small bitterness in the end. On tap at a brasserie in front of the Gare de Lyon. An adequate industrial lager - this is certainly not a godlen ale. Light body, some yeast character, dry finish. Bottled. Lightly hazy deep golden, brief head. Fruity nose with lots of cardboard and notes of licorice plus alcohol. Sweet and mushy, no hops detected. Some aniseed comes through in an alcoholic finish. Beautiful golden pour with a huge head, maybe abit over-carbonated. Grains,grass dominate, abit sticky, but quite drinkable, not a bad brew, but nothing great, average. No blond ale, questa è una pale lager un po’ più spiccata; eurolager con qualche punto di piccantezza in più ma non molto dissimile da certe lager industriali italiane, mettiamo fra le meno schifose tipo Menabrea. Niente di eccezionale.